Let’s face it, as agents we’re either promoting properties to sell or educating the public about changes in the real estate market or tips professionals know that the public may not. For years agents used traditional print marketing, TV, radio, billboards, mail outs, signs, banner advertising, and more. Many of these are still very effective and they’re used by large and small companies to this date, however video has exploded on the scene as a medium anyone can use to further illustrate a message. Newspapers are using video as a way to compete with TV stations. Large news organization post videos provided by viewers, Viewers become extra eyes in the field. Courts are using video from police cars, and defendants are using video to tell their side of the story. Video doesn’t replace older media, but it does open up new ways of reaching consumers. The Y generation would just as soon search the Internet and watch videos about a subject than watch the news or visit a library, so reaching younger consumers requires change. If I comment to my children I’m having difficulty hooking something up, they’ll have a YouTube video up in about 15 seconds thoroughly explaining the task. I guess those bad instructions in the box don’t matter so much now. High definition video cameras make it easy to produce video. The trick is proper lighting and sound. We’ve created some high quality videos and some quick videos that tell a simple message about the market without all the bells and whistles. What we’ve found is viewers don’t seem to care about the bells and whistles as long as the video is informative, timely, and matches what they’re looking for. 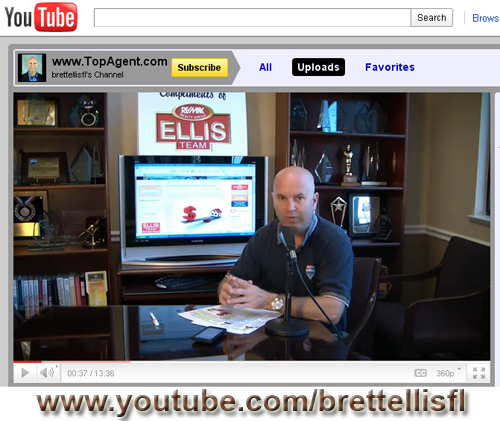 We’ve created a YouTube channel http://www.youtube.com/brettellisfl Currently we have 113 videos uploaded and about 45,000 views. Our property tours are located on another channel, so these 45,000 views are simply people tuning in to hear about the market or timely news affecting real estate. Marketing really works when you tie all the media together. For instance, our print ads show our website. Our website has links to our YouTube channel, property tours, MLS search, and more. Our MLS search has links to the others as well. In this way we get all the marketing tools we invest in to work together, in concert. Together these tools can be so much more effective than if we just used on over the other. Consumers are like cable TV viewers. If you’ve ever flipped channels you’ll notice there are a lot of things on at any one time, and they’re competing with each other. Younger viewers like MTV, while older viewers might like the History channel or national news. There is a place for each, and while they cross over, each definitely has a certain target demographic. Marketing is similar. Each method could potentially reach everyone, but realistically there are target demographics, and getting them to work in concert with each other increases frequency and reach. It also sends out a message to the public when they see you more than one place. They think you’re everywhere. No matter where an agent puts their marketing dollars, the message is critical. It pays to be clear, concise, and topical. The public enjoys getting this information in print, on smart phones, and certainly in video form. Look for video to play an increasing role in the dissemination of real estate information. Video will help companies and agents differentiate themselves and allow consumers to decide who they best want to do business with. It could be the information, the look, the professionalism, etc. Video opens up an array of ways a consumer can evaluate who they do business with and assist in making a choice. And if you ever want to know how to unclog a sink or hookup a BluRay player, consider doing a video search, or ask a 10 year old. Posted in Southwest Florida Real Estate.Tagged Future of Real Estate.